As I was thinking recently about a knitting project to put on Yarn Scissors Silk, I was reminded of a small project I'd seen recently in a yarn booth at a trade show. Fair Isle Yarn had a basket full of Knitted Knockers which were made using Fair Isle's Harbor yarn consisting of washable cotton and viscose. Click for our complete Knitting Basics series. Knitted Knockers, a funny sounding term, are soft, comfortable, knit prosthetics for breast cancer survivors. Barb Demorest is the founder of this amazing organization which makes and supplies breast-shaped knit prosthetics to breast cancer survivors who have gone through a mastectomy. Barb is a breast cancer survivor herself and due to complications, reconstruction wasn't an option for her. Barb talked to her doctor about silicone prosthetics and found out that many women aren't happy with that solution. They are hot, heavy and expensive. After Barb's surgery in 2011, she was unable to knit right away and had a friend make one of these "Knockers" for her. 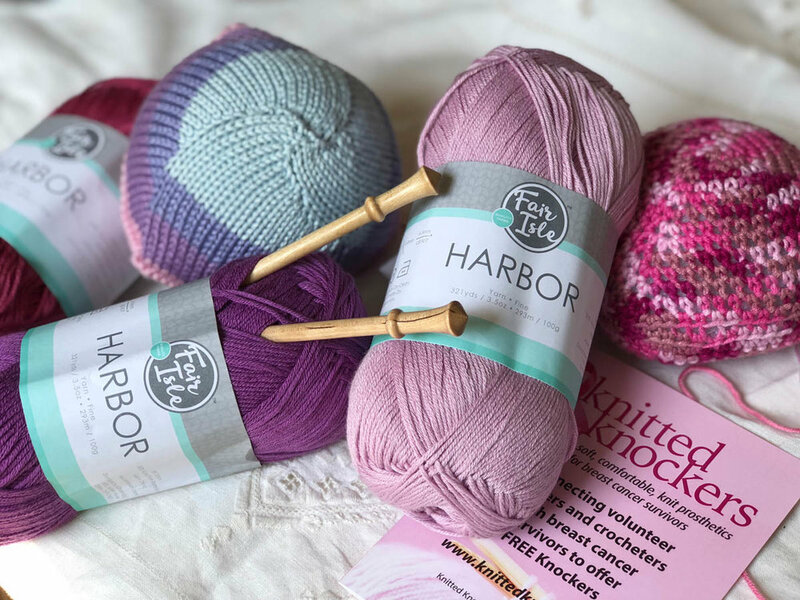 It changed her life and she set out on a mission to help other women in this situation by providing patterns and support to knitters, who donate the finished Knockers to those in need. In 2012, I was diagnosed with breast cancer myself and I know the pain and embarrassment a woman feels after a (in my case bi-lateral) mastectomy. I had a history of this terrible disease and was lucky (yes I said lucky) that they diagnosed mine when they did so that surgery and treatment would hopefully give me my life back. My mom was a huge inspiration, as I'd seen her go through breast cancer ten years before. Thank God she was (and still is) around to help me through a difficult time. I was fortunate enough to have reconstruction after my mastectomies and I can tell you that even with reconstruction, this surgery takes away part of your womanhood. Scars are a constant reminder of the cruelty of this disease but the love and support of others helps one through it. I had friends remove my bandages and help me shower, they took me to chemo, and cooked for us. It's hard even when the surgeries and chemo are done because there is the constant worry of a worst-case scenario. Knowing that life is short keeps me trying to make the most out of each day and pursuing the work and causes that I love. 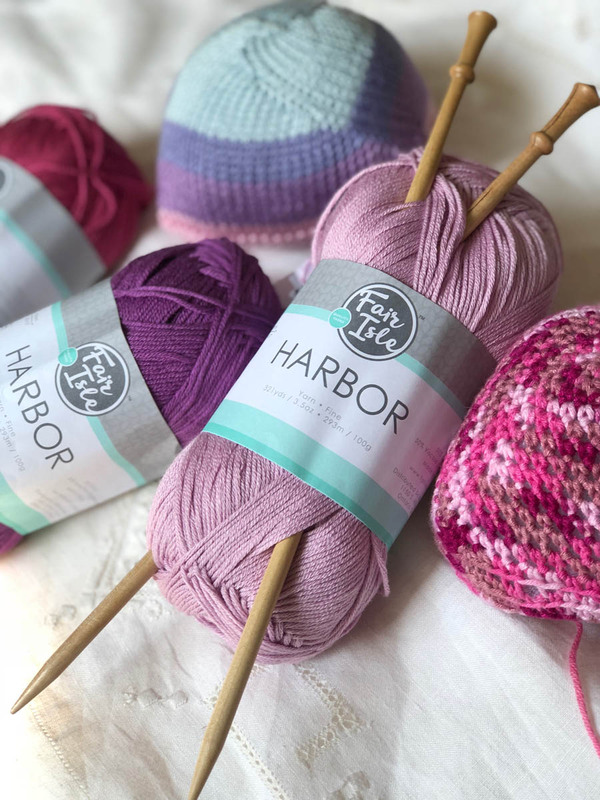 I hope you'll click on the links below to learn about Barb's story and how you might be able to help this organization by knitting for others, starting a group or helping distribute the "Knockers." You can give a gift to a woman going through this life changing event; one who probably feels like they've lost a part of themselves. On the Knitted Knockers site you'll read about why only certain yarns are approved for these Knockers, since they will be worn next to sensitive, scarred skin. The yarn (like Fair Isle's Harbor yarn) should be yarn that stays soft even after washing. By volunteering to make or distribute these Knockers, you may just be giving another woman the biggest gift she's ever known: that of your time, support and love. Best wishes for health and happiness. Knitted Knockers USA distributes free Knitted Knockers to anyone requesting them. Made with Love, Given with Hope"
Patterns: To help by making and/or donating Knitted Knockers, click here for official patterns; instructions are available for knitting in the round with double-pointed needles or flat-knit with circular needles, in English, Spanish, or German. How-to Videos: click here for Knitted Knocker instruction videos made my Terry Neal that include demonstrations for knitting I-Cord, stuffing, determining cup size, and finishing. Cash Donations: Click here to support Knitted Knockers Charities efforts with a cash donation via PayPal or check. Shop: When you shop at smile.amazon.com, select Knitted Knockers Charities LLC. On All Amazon orders that you place through this site, they will give Knitted Knockers Charities .5% of your purchase at no extra cost to you. Click above to shop and help us help others. Please contact Knitted Knockers to learn about current cup-size needs: info@knittedknockersusa.org. Contact Knitted Knockers Charities, Inc. via email at info@knittedknockersusa.org.